An acre of permanent street-scene sets was destroyed by a fire that broke out on Universal's back lot shortly before 5 pm. None of the street scenes involved in the fire was in use. A complete theater set on New York Street, a landmark for twenty years, was consumed in the fire. The heat melted and twisted the steel girder frame of the building that had been used in numerous films. The last film to use the set was the remake of My Man Godfrey (1957) starring David Niven. The damage was estimated at $500,000. 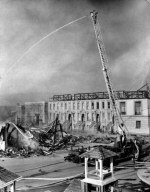 New York street film studio set at Universal-International (now Universal) Studios is destroyed by arson fire. Firemen are seen battling the $500,000 blaze. Universal Newsreel. 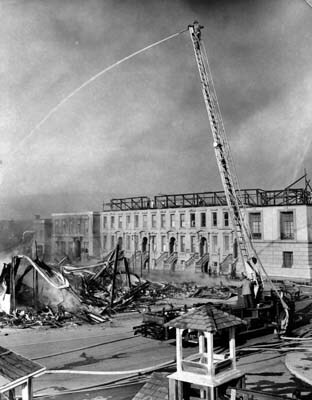 Fire sweeps through Universal Studio film lot in 1957. Fires wipeout a block of sets, backgrounds and equipment. Fires manage to miss sound stages.